We planted runner beans in our garden last summer. We didn’t expect all the seeds to take, but they did, and boy did they flourish! The glut was overwhelming. Now, I like a runner bean as much as the next person but when you’re eating them, day in, day out, it all gets a bit tiresome, no matter how diverse your culinary skills. Aside from just serving them up as an accompaniment, I sprinkled the cooked beans, chilled, into salads, I tossed them into spaghetti with torn prosciutto and crème fraîche, I added them to soups, stir-fries and dals and I cribbed this recipe from Valentine Warner to make a couple of jars of runner bean chutney. We also gave handfuls of the beans to neighbours and I blanched and froze masses. The runner beans are our only remaining crop from last year and each time I go to the freezer, they taunt me from the lower shelves, winking at me as if to say: yep, we’re still here, what you gonna do about it? I have to ration them because after last summer’s abundance, Ade developed an aversion to them from which he hasn’t fully recovered. Occasionally I’ll serve them up with the Sunday roast, burying them under some cabbage in the hope that he won’t notice. 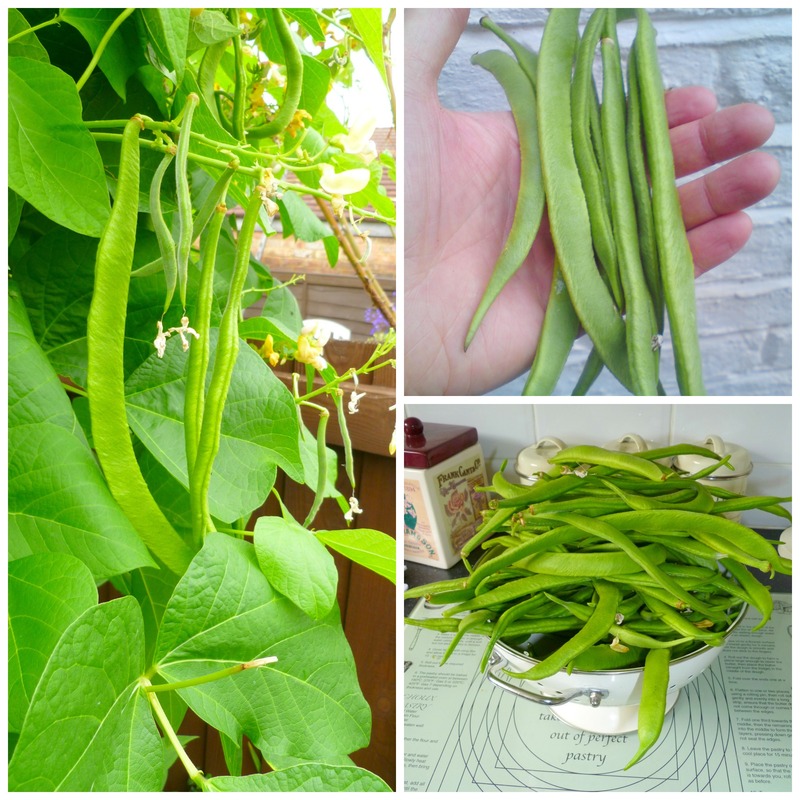 We don’t know if we’ll grow any on the allotment this year (we might need a bean sabbatical! ), but while we have a few portions left lurking in our freezer (eleven at my last count), Risotto Primavera is an excellent solution. 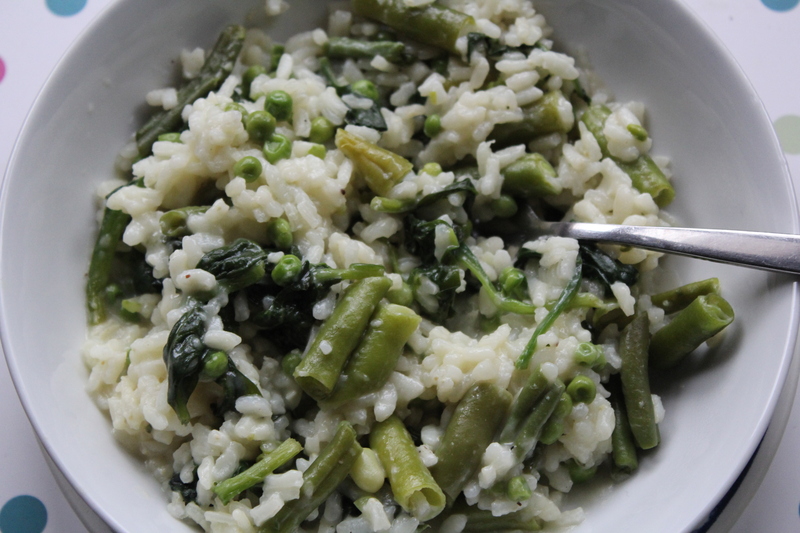 Its name translates as ‘spring risotto’ which is a little bit of a misnomer in this case as I’m using up last summer’s stock of green beans, and while fresh beans would be preferable, it still works really well with frozen ones, the richness of the other flavours masking the limp texture cooked-from-frozen beans sometimes have. Heat the oil in the pan then add the garlic and rice, stirring continuously for two minutes so the rice is well coated in the oil. Pour in the wine and cook until the rice has absorbed it all, before adding the stock a ladleful at a time, stirring well until this is all absorbed. Continue adding and stirring until you have one ladleful left. After about fifteen minutes when the rice is almost tender, add the vegetables and a splash more stock and stir for a further 3-5 mins (making sure you add any frozen veg a couple of minutes before the fresh veg). Add the lemon juice, herbs and the final splash of stock if needed. Stir in the butter and parmesan until thick and creamy. Season well with black pepper. Loved this lament about the glut of runner beans – I know the feeling so well, but boy, I loved the recipe – so big thanks for that! Thank you for the recipe, love risotto and beans and thankfully so does Izzy. She tends to eat all the ones at the lower level as a snack walking around the allotment, that and the peas. Wow, she’s one healthy little girl! Glad you liked the recipe!